Originally from Dangs tract in Maharashtra which is a hilly tract with heavy rainfall and very poor agricultural economy. These hills run north to south, with spurs on the eastern side. Though the average altitude of this region is about 600 m, the highest elevation rises to 1,350 m above msl. Dangi breeders are seminomadic and belong to Kanadi, Mahadeo Koli, Thakor and Maratha communities who practice seasonal migration for around 9 months in a year (January to September). During the hot and dry season, the breeders migrate towards coastal areas where grass, tree fodder and water are available. During the period of heavy rainfall, they settle down at the foothills for protection from the cold draught. Green grasses are available in forest areas during July to September. Paddy is extensively grown in the area. Mostly animals are reared on grazing. These animals are well known on account of its hardy nature and ability to work hard under very heavy rainfall conditions. Most of the animals are reared for draft purpose since milk production is low. 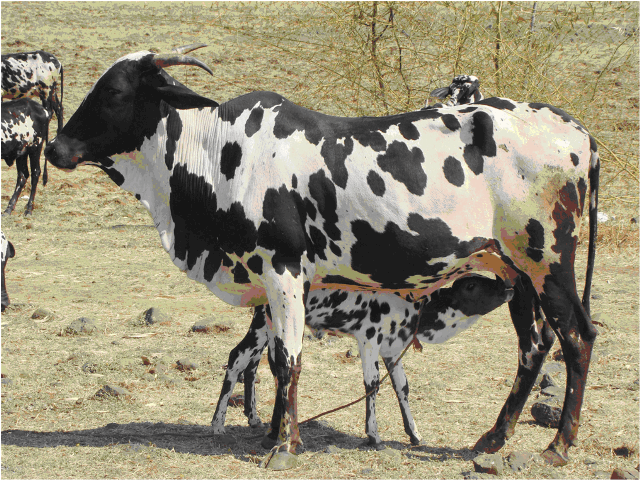 The breed is similar to Deoni and fit into group of cattle represented by Gir, Red Sindhi and Sahiwal. Characters: The animals are mostly broken red and white or black and white in skin color. Skin is of medium thickness and coat is shiny because of an oily secretion which protects it from heavy rains. Considering different shades of skin color, six different strains have been recognized by the breeder farmers. “Para” means complete white colour with few black spots. The male of this type commands better market price due to their appearance. 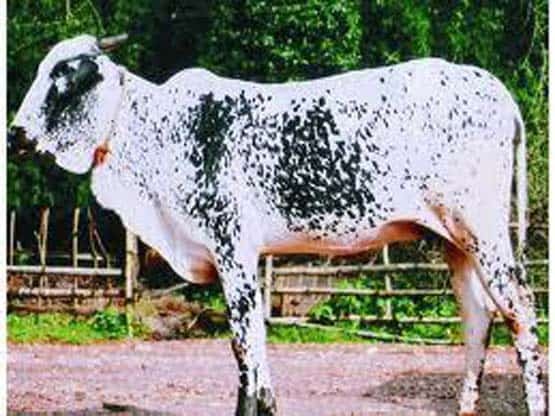 “Bahala” is named for animals with combination of white and black; but when white color is predominant over black it is called “Pandhara Bahala” and “Kala Bahala” when black colour is dominating. “Maneri” means complete black with few white spots. The animals of the above coat colours are encountered in Ahmadnagar, Nashik district and Dangs district. “Lal” (predominant red colour with few white spots “Lal Bhahala” are found mostly in Dangs and Nashik districts. The animals are medium in size, with deep bodies and generally of ponderous built. The head is usually small with a slightly protruded forehead. On an average the height behind the hump ranges from about 45 to 50 inches while the heart girth measures from about 58 to 60 inches. The ears are small, muzzle is large, horns, though of variable size, are generally short and thick. The hump is medium sized and firm. The dewlap is slightly pendulous. The sheath, though loose, is not excessively pendulous. 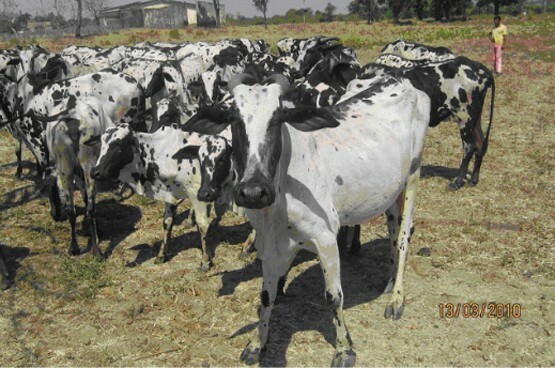 These animals are considered excellent for draft as they have powerful hind and forequarters with a short back well-coupled with short but stout legs. The hooves are exceptionally hardy, being black and flint-like. Dewlap is slightly pendulous. The animals have powerful hind and forequarters with a short back well coupled and the legs are short and stout. As draft animals they carry heavy timber at the rate of 2 to 3 miles per hour depending upon the type of terrain and can cover a distance of 20 to 24 miles per day. Cows are poor milkers but attempts have been made to improve milk production by crossbreeding. Milk yield averages 530 kg (range 32 to 1,228 kg) in an average lactation period of 269 days (range 100 to 396 days). Average fat in milk is 4.3%.